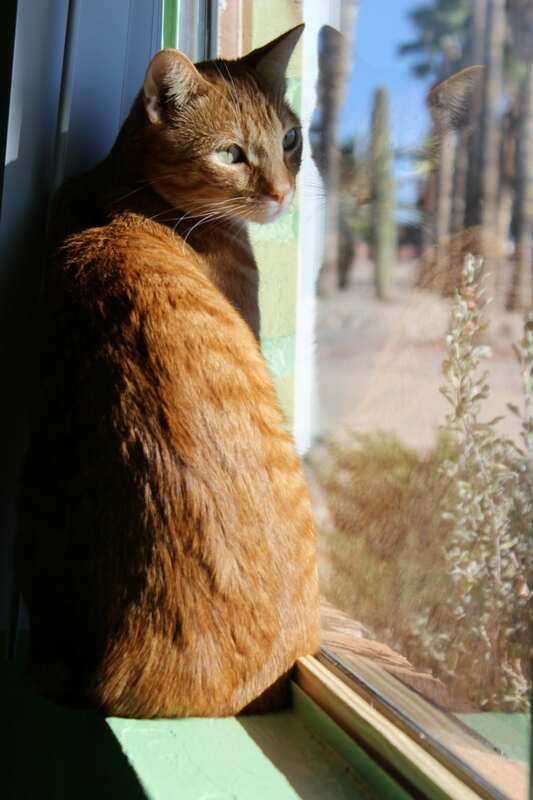 When my husband and I first moved to Tucson, we spent three months living in a really tiny guest house. The bedroom, kitchen, and living room were all the same room, thankfully we had a separate bathroom! The only kitchen appliances we had access to were a microwave, convection oven, toaster, and one hot plate, and if you used more than one appliance at a time, the power would go off. The only saving grace I had was the grill outside. Needless to say, during the three months that we lived there we ate a lot of hotdogs, grilled chicken, and hamburgers. My husband is a pizza fanatic; he could eat it every day and never get tired of it. The convection oven was really small and he would have to cut his frozen pizzas in half in order to cook them in it and they always made a huge mess. I got tired of eating regular old hamburgers and he got tired of cooking half a pizza at a time. 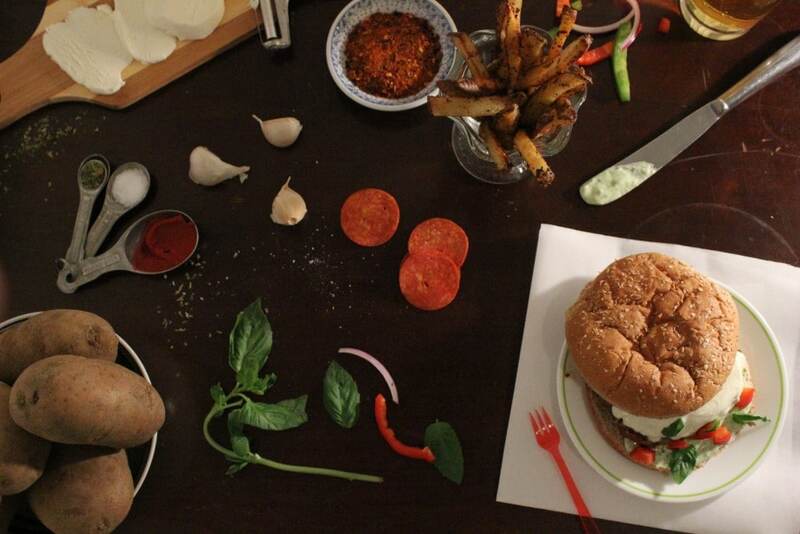 This predicament led to the pizza burger and I have been making it ever since! We like to eat pepperoni, peppers, and onions on our pizza so that is what I add, but you are more than welcome to make these with the toppings of your choice. You can’t eat hamburgers without French fries, so I decided to keep with the pizza theme and add some pizza flavorings to my French fries. Unless I am baking, I’m usually really bad at measuring and I tend to just throw ingredients in the bowl until it looks right or tastes good. I have tried to put a measurement with each spice that I use, but if you think it needs more or looks like a bit too much, please feel free to adjust to your liking. I hope you enjoy! 4 Russet potatoes, sliced into French fries. In a large bowl combine potatoes cut into French fries, garlic powder, salt, pepper, Italian seasoning, and red pepper flakes. Drizzle with olive oil and toss to coat. 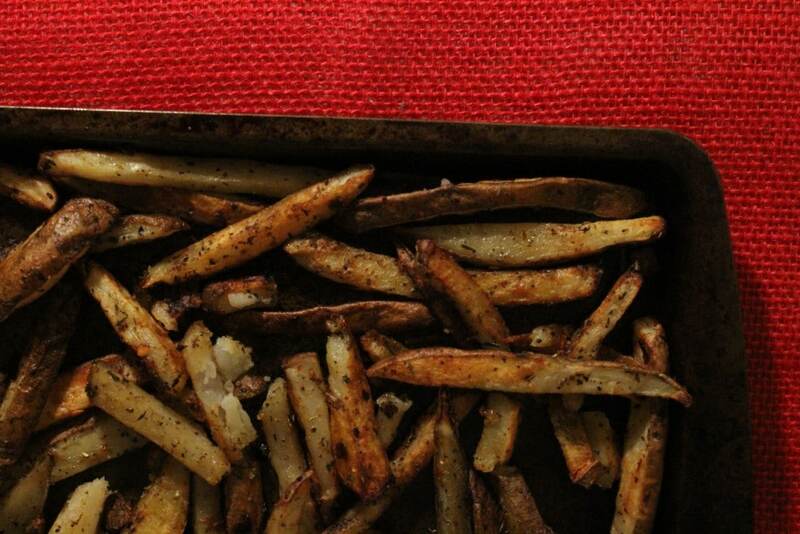 Place French fries on a sheet pan coated with olive oil and place into the 400 degree oven. Bake for about 40 minutes, flipping once or twice. In a small bowl combine mayonnaise, basil, and salt. Blend together using a food processor or immersion blender. If you don’t have either, just mix together, well. Set sauce aside. Chop green pepper, red pepper, and onion into small bite size pieces. 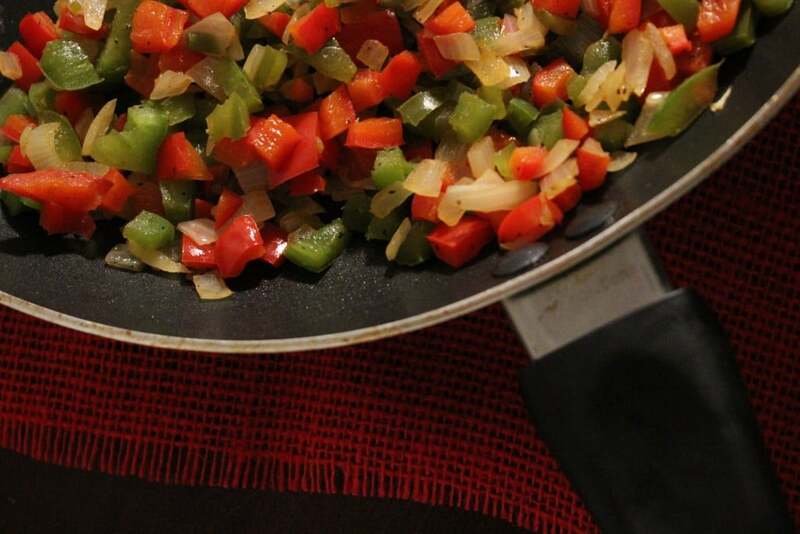 Cook in a saucepan over medium heat with oil, salt, and pepper until soft. Set aside to cool. In a large bowl, combine ground beef, egg, bread crumbs, tomato paste, pepperoni pieces, cooled pepper and onion mixture, 1 clove minced garlic, ½ teaspoon salt, ¼ teaspoon pepper, 1 teaspoon Italian seasoning, pinch of red pepper flakes. Cook pizza burgers on a grill or stove top until desired doneness. 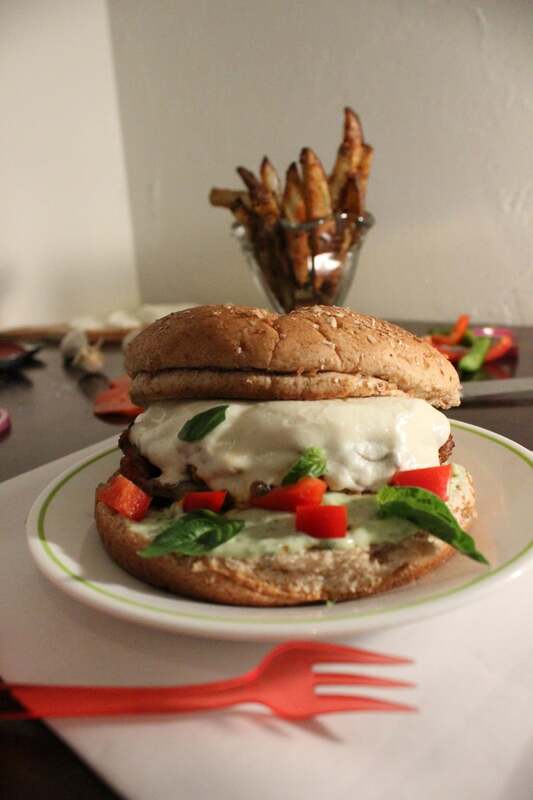 When just about finished, cut thick slices of mozzarella cheese and place on top of each burger. Finish cooking until cheese is melted. 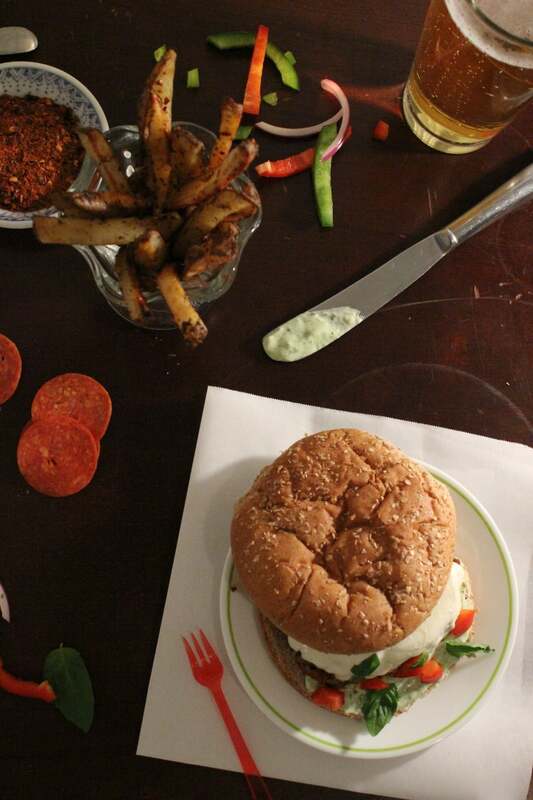 Spread buns with basil mayonnaise and top with hamburgers. 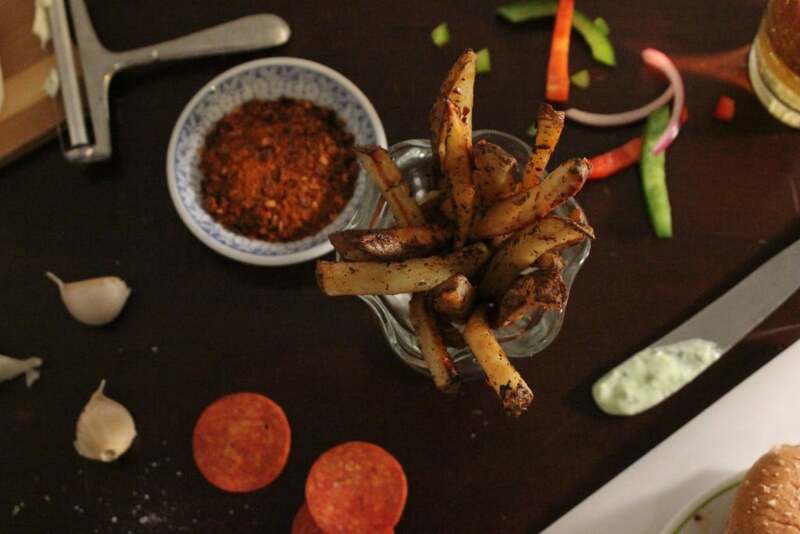 Basil mayonnaise is also a great dipping sauce for the fries.